Total Dhamaal (also known as Dhamaal 3) (transl. Total fun) is a 2019 Indian Hindi-language adventure-action comedy film directed and co-produced by Indra Kumar. It is the third installment of the Dhamaal film series. It is a sequel to 2011's Double Dhamaal. The film stars Ajay Devgn, Madhuri Dixit, Anil Kapoor, Riteish Deshmukh, Arshad Warsi and Javed Jaffrey in leading roles, and Esha Gupta in a guest appearance. The film was released on 22 February 2019. The film is a slapstick comedy loosely borrowed from 1963 Hollywood film It's a Mad, Mad, Mad, Mad World. The film grossed ₹226 crore (US$31 million) worldwide thus becoming the third highest grossing Bollywood film of 2019. Total Dhammaal starts with a different storyline from (Dhamaal) and (Double Dhamaal). Guddu (Ajay Devgan) and his partner ((Sanjay Mishra) steals an amount of Rs 500 millions of black money from the Police commissioner of Mumbai (Boman Irani). As they put the suitcases comtaining the money to their driver Pintoo(Manoj Pahwa), Pintoo runs with the money fooling Guddu and Jonny. After that.we are introduced with the other characters of the movie. Besides Riteish Deshmukh, Arshad Warsi and Javed Jaffrey, director Indra Kumar signed Ajay Devgn for the third part of his Dhamaal film series in late May 2017. Anil Kapoor and Madhuri Dixit were also signed in mid-November 2017 marking their collaboration after seventeen years when they acted together in the film Beta. Esha Gupta was signed in June 2018. In late December 2017, Ajay Devgn FFilms collaborated with Fox Star Studios to produce the film. Pen India Limited and Mangl Murti Films came on board as co-producers. Principal photography commenced in Mumbai on 9 January 2018. Music for the film is composed by Gourov-Roshin, with lyrics by Kumaar and Kunwar Juneja. The first teaser look of the film is released on 14 January 2019. The first look theatrical poster was released on 18 January 2019. The second look poster released on 19 January 2019 with trailer release date announcement on 21 January 2019. Third official theatrical poster of the film is unveiled on 20 January 2019. It is promising "The wildest adventure ever!" Two theatrical fresh look posters of the film are made public on 21 January 2019. These have pictures of main cast on it. The official trailer of film was released on 21 January 2019. To boost their marketing efforts Fox Star Hindi has released the spoof trailers of the film in different Indian languages. The Video Song from film titled as "Paisa Paisa" was premiered on 29 January 2019. The film was set to release worldwide on 7 December 2018 but due to extended VFX work the release date has been pushed back to February 22, 2019. The film has been certified with runtime of 127 mins by British Board of Film Classification and all set to release on schedule. The film was released on 22 February 2019 on 3700 screens in India and on 786 screens in overseas market making worldwide count of 4486 screens. After Pulwama attack, Ajay Devgn and Total Dhamaal makers have decided not to release Total Dhamaal in Pakistan. The makers of the film including the entire crew, actors and makers have donated ₹50 lakhs to families of soldiers who died in the Pulwama attack. The film became available as VOD on Hotstar on 20 April 2019. Going by Rotten Tomatoes, the film has scored 43% based on 7 reviews. Taran Adarsh rated the film with three stars and found it entertaining and loaded with clean humour. Himesh Mankad from Koimoi gives 3 star out of 5 says "Total Dhamaal is a fair clean entertainer that can be enjoyed with the entire family. It's definitely an improvement over previous installment Double Dhamaal" Trade analyst Sumit M kadel stated that "Total Dhamaal is funny specially in Ist half. Its a no brainer fast paced family entertainer, lavishly shot & well performed by Ajay Devgn, Madhuri Dixit, Anil Kapoor, Riteish Deshmukh & the entire cast. 2nd half is moderate & it could have been better. Overall Good film." Rating- 3 out of 5 Ronak Kotecha writing for The Times of India gave two stars out of five and feels that in the ensemble cast, the film had the potential to be a comic roller coaster ride. He concluded saying "However, the fact that the film is slapstick is not a problem, what brings it down is poor writing and execution." Raja Sen writing for Hindustan Times rated the film with one star out of five. The opening day (non-holiday) collection of the film from Indian market was ₹16.50 crore. Its lifetime domestic gross collection was ₹182.09 crore and from overseas markets it was ₹44.19 crore. The worldwide gross collection of the film was ₹226.28 crore and domestic nett collection was ₹154.23 crore. The film grossed ₹100 crore (US$14 million) worldwide in three days of release. In opening week the film grossed ₹150 crore (US$21 million). In 12 days of its release the film crossed ₹200 crore (US$28 million) mark in gross collection. ^ a b Ajay Devgn [@ajaydevgn] (25 October 2018). "December date with you'll looks challenging, but still keeping my Feb date! Due to extensive VFX work, Total Dhamaal will now release on 22nd Feb and De De Pyaar De moves to 26th April" (Tweet) – via Twitter. ^ "Total Dhamaal 2019 | British Board of Film Classification". Bbfc.co.uk. 12 February 2019. ^ "Total Dhamaal box office collection prediction: Ajay Devgn, Anil Kapoor starrer set for double-digit opening". Zeebiz. Retrieved 23 February 2019. ^ a b c "Total Dhamaal Box Office Collection till Now - Bollywood Hungama". Bollywood Hungama. Retrieved 20 April 2019. ^ a b c "Bollywood Top Grossers Worldwide Bollywood Hungama". Bollywood Hungama. Retrieved 20 April 2019. ^ "Total Dhamaal (2019)". Box Office Mojo. ^ Sharma, Devesh (23 February 2019). "Borrowing the template of Stanley Kramer's satire on greed, It's a Mad, Mad, Mad, Mad World (1963) director Indra Kumar has made a slapstick comedy". Filmfare. ^ "Sonakshi Sinha and Ajay Devgn in remake of 'Mungda'". 19 September 2018. Retrieved 19 September 2018. ^ "AJAY "DEVGN TO PLAY THE LEAD IN TOTAL DHAMAAL". ^ "Excited to work with Anil Kapoor after 17 years in Total Dhamaal: Madhuri Dixit". The Indian Express. 4 December 2017. Retrieved 22 January 2019. ^ "INDRA "KUMAR REUNITES MADHURI DIXIT, ANIL KAPOOR". ^ Hungama, Bollywood (16 June 2018). "EXCLUSIVE: Esha Gupta joins Total Dhamaal; film to release in 3D - Bollywood Hungama". ^ "Ajay "Devgn collaborates with Fox Star India for Total Dhamaal". ^ "Ajay Devgn starrer Total Dhamaal release date announced". 8 January 2018. ^ "Madhuri, Ajay, Anil recreate 80s hit song Paisa Yeh Paisa in Total Dhamaal"
^ "Aamir "Khan Gives First Clap For Ajay Devgn, Anil Kapoor, Madhuri Dixit's Total Dhamaal Shoot". ^ "AJAY "DEVGN KICKS OFF TOTAL DHAMAAL WITH REGULARS AND NEW ENTRANTS ANIL KAPOOR, MADHURI DIXIT, BOMAN IRANI". ^ "Total Dhamaal: Ajay Devgn, Anil Kapoor and Madhuri Dixit recreate Karz's song Paisa Yeh Paisa". PINKVILLA. ^ "'80s hit track 'Paisa Yeh Paisa' recreated for 'Total Dhamaal' - Times of India". ^ "Total Dhamaal - Original Motion Picture Soundtrack". JioSaavn. ^ Taran Adarsh [@taran_adarsh] (14 January 2019). "First look of Ajay Devgn with Crystal from #TotalDhamaal... Costars Anil Kapoor, Madhuri Dixit, Riteish Deshmukh, Arshad Warsi, Jaaved Jaaferi, Sanjay Mishra and Pitobash... Directed by Indra Kumar... Fox Star Studios presentation... 22 Feb 2019 release. t.co/DzfHHWDHvP" (Tweet) – via Twitter. ^ "Total Dhamaal first look: Ajay Devgn and a Hollywood star named Crystal". Hindustan Times. Retrieved 14 January 2019. ^ Taran Adarsh [@taran_adarsh] (18 January 2019). "And here comes the first look poster of #TotalDhamaal... Trailer on 21 Jan 2019... 22 Feb 2019 release. t.co/P3aEAUlS3b" (Tweet) – via Twitter. ^ Taran Adarsh [@taran_adarsh] (19 January 2019). "Trailer on 21 Jan 2019... Here's the second poster of #TotalDhamaal... Directed by Indra Kumar... 22 Feb 2019 release. t.co/pd40DIZkk7" (Tweet) – via Twitter. ^ Taran Adarsh [@taran_adarsh] (20 January 2019). "Trailer out tomorrow... Here's the third poster of #TotalDhamaal... Directed by Indra Kumar... 22 Feb 2019 release. t.co/1jpCIJ5zdY" (Tweet) – via Twitter. ^ Taran Adarsh [@taran_adarsh] (21 January 2019). "Trailer out today... New poster of #TotalDhamaal... Directed by Indra Kumar... 22 Feb 2019 release... #TotalDhamaalTrailer t.co/AA4Q3glF3o" (Tweet) – via Twitter. ^ Taran Adarsh [@taran_adarsh] (21 January 2019). "And here's another poster of #TotalDhamaal before the trailer drops today... Directed by Indra Kumar... 22 Feb 2019 release... #TotalDhamaalTrailer t.co/Duc8kEUWGx" (Tweet) – via Twitter. ^ "Total Dhamaal - Official Trailer - Ajay Devgn - Anil Kapoor - Madhuri Dixit - Indra Kumar". YouTube. ^ "Total Dhamaal - Trailer Spoof Punjabi - Ajay-Anil-Madhuri-Indra Kumar|Feb. 22nd". FoxStarHindi on YouTube. 11 February 2019. ^ "Total Dhamaal - Trailer Spoof Gujarati - Ajay-Anil-Madhuri-Indra Kumar|Feb. 22nd". FoxStarHindi on YouTube. 12 February 2019. ^ "Total Dhamaal - Trailer Spoof Bhojpuri - Ajay-Anil-Madhuri-Indra Kumar|Feb. 22nd". FoxStarHindi on YouTube. 12 February 2019. ^ "Paisa Paisa Total Dhamaal - Ajay Devgn - Anil Kapoor". Saregama on YouTube. ^ "Total Dhamaal: Anil Kapoor-Madhuri Dixit-Ajay Devgn's film to release on next year"
^ Taran Adarsh [@taran_adarsh] (17 February 2019). "#TotalDhamaal certified PG by British censors on 15 Feb 2019. Approved run time: 126 min, 52 sec [2 hours, 6 minutes, 52 seconds]... #Overseas #UK" (Tweet) – via Twitter. ^ Taran Adarsh [@taran_adarsh] (22 February 2019). "#TotalDhamaal screen count... India: 3700 Overseas: 786 Worldwide total: 4486 screens Has opened well in mass circuits... Metro plexes are decent... Biz at plexes should grow in evening shows when family audience, generally, turns up" (Tweet) – via Twitter. ^ Hungama, Bollywood (18 February 2019). "After Pulwama Terror Attacks, Ajay Devgn and makers to NOT release Total Dhamaal in Pakistan - Bollywood Hungama". Retrieved 19 February 2019. ^ "Total Dhamaal". Hotstar. April 2019. Retrieved 20 April 2019. ^ "TOTAL DHAMAAL (2019)". Rottentomatoes.com. Retrieved 24 February 2019. ^ Taran Adarsh [@taran_adarsh] (22 February 2019). "#OneWordReview…#TotalDhamaal: ENTERTAINING. Rating: ⭐️⭐️⭐️ No one is looking for logic here... Focusses on humour and entertainment... First half hilarious... Second half could've been tighter... Loaded with clean humour... Families and kids should like. 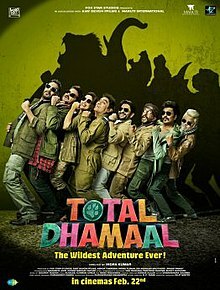 #TotalDhamaalReview t.co/EQitTkHEH2" (Tweet) – via Twitter. ^ "TOTAL DHAMAAL MOVIE REVIEW". Retrieved 22 February 2019. ^ Kotecha, Ronak. "TOTAL DHAMAAL MOVIE REVIEW". Times of India. Retrieved 22 February 2019. ^ Sen, Raja. "Total Dhamaal movie review: Yet another Ajay Devgn atrocity. 1 star". Hindustan Times. Retrieved 22 February 2019.